SOTA gives priority to requests from SOTA customers however will try and assist others as well. Due to the many requests for spare parts from all over Australia and overseas, those who have not purchased a tractor from SOTA, must use the email form below. SOTA customers may ring or email as they prefer. We carry thousands of spare parts on our shelves to support our Farmtrac, APOLLO tractor and Kubota tractor customers. This is one of the key reasons our customers purchase from SOTA. 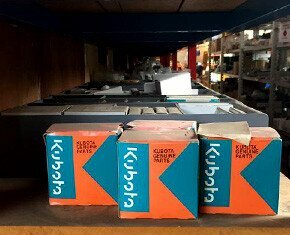 Over the years SOTA Tractors has fielded thousands of enquiries for spare parts, in particular Kubota spare parts. These enquiries are frequently for models of tractors and implements that we don’t import or for frustrated owners who have purchased from a dealer that subsequently refuses to provide after-sales support. Spare parts identification is a time consuming process, nonetheless, we always respond to these owners and do our best to guide them in the right direction, if we can’t assist them ourselves. Please note: we are unable to accept parts enquiries by phone, from customers that didn’t buy a tractor through SOTA. Please email SOTA, using the form below and our service staff will respond as soon as possible. We appreciate your understanding. It is important to include clear photos of parts required. Please save time and include them now.